Plethora of Randomness from "the Most Peaceful Place Under the Sky"
I haven't posted anything to this blog in a few days, but I thought I would update it by posting some things that I feel like I should praise God for today. 1. I am really thankful to God for giving me allergies to pork, seafood, and tofu! When I first found out I was allergic to so many things a little over a year ago, it was hard to figure out what to eat and it was not that much fun! I did eventually adjust to it and I handle it pretty well now. As hard as it was to adjust in the U.S., it is even harder to adjust in Korea since the main products Koreans eat are seafood, pork, and tofu! They have the occasional beef and chicken, but it is really hard to find here and even if a restaurant has it, I can't read Korean so I don't always know. I realized the other day that having these allergies was not that bad and it has given me even more reason to be thankful to God! Some of my teachers were eating live octopus that was still moving in the tray the other day. Totally Disgusting! A lot of times the fish that is served at the table still has the eyes and everything attached. Yuck! Also, a lot of the pork here resembles bacon and is more fat than meat! Double Yuck! All of these things have made me realize that it is often the most simple things that we forget to praise God for on a daily basis! 2. This one is really huge for me...I found out close to a month ago about the orphanage that is within walking distance from KNU where I live! Several professors here and friends at the church have tried to put me in contact with people that could help me volunteer there, but after many calls, facebook messages, and attempts at church, I always came up short! Current volunteers had been in contact with workers at the orphanage and I was approved to go, but the main problem was that no one was ever able to show me where it was! The saddest part was that I had been told the orphanage was near a big department store that I can actually see from my dormitory! It really bothered me because all I wanted to do was volunteer my time! Finally this past Sunday, one of my friends, Margaret who is Korean-American and therefore speaks very good Korean, told me she was volunteering at the orphanage on Thursday! She also offered to take me to the orphanage to meet one of the main teachers there. So today, I had a meeting at the orphanage and I get to go tutor some elementary children this Thursday! I am so excited because it is one of my life-long passions to work in an orphanage! I am also excited because I have been praying about this since I heard the orphanage was so close to KNU. I really wanted to work with babies and toddlers, but the teacher we met with said her main need is English tutoring because the children there do not know any English, at all. I am excited because I will be tutoring 2 students, but she wants it to be more like mentoring than just teaching. We will be able to take them places and get to know them more personally than I am able to do at school because there are so many kids. I just want to Praise God for answering my prayer and helping me to fulfill the desires of my heart! He is an awesome God! 3. I am really thankful for the Internet! I realize that more and more as I think about living on the other side of the world from my family and friends! It would be so much harder being in Korea if I was not able to instant message, text, call people on skype, and look at everyone's photos on facebook! Well, I think I have rambled enough for the day! There are so many things that I could praise God for, big and small, but I will leave it at those 3 for this blog! It has been almost a month since I updated this blog. The last time I updated it, Korea was beginning Chuseok, their thanksgiving holiday, and I had 5 days off of school. It was good because I got caught up on sleep and felt refreshed for the rest of that week. I have mentioned several times to people who know me the importance of Sabbath rest. I realize even more now how important it is. I made a promise to myself and to God to set aside time for Sabbath rest once a week. I will be honest...It would be surprising to me if I have done this once a month. Living in a different country and trying to adapt to the culture takes a toll on a person. It doesn't help that I have complicated matters by taking 3 seminary classes and teaching English in the elementary schools which I have never done before.I am also a very social person that wants to experience all of the beautiful sights that can be seen in Korea. I also know that I came to Korea to share Christ's love with people and be involved in building the Kingdom of God. Sometimes it is all a little overwhelming, but when I take the time to allow God to restore, renew, and refresh my Spirit, I am a more effective disciple of Christ. Tomorrow is Korean Foundation Day, so there is no school. I have the opportunity to go on a few day trips, but I have decided I need to spend this time resting and spending time alone with God. I will be in Korea atleast 11 more months, so there is no reason that I have to do everything that can be done in my first few months here! Since I have been in Korea a little over two weeks, I have been diligently practicing with chopsticks. I had my first experience with Korean chopsticks when I got off of the plane in Seoul. It was a disaster because I have never really used chopsticks and Korean chopsticks are metal, thick, and very slick. I have found my favorite Korean food. It is commonly found around here and it is very cheap. It usually ranges from 3500 won-4000 won. 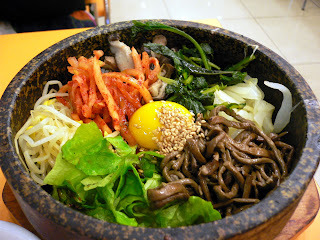 It is called Dolsot Bibimbap. I actually like any variety of bibimbap, but this kind is definitely my favorite. It looks like this, comes in a stone pot that is cooking when they bring it to you, and is mixed with rice and hot pepper paste. For some of you who worry about raw eggs, the egg actually cooks when mixed with everything. Also, beware of the hot pepper paste. If you put too much, your eyes water and your nose starts to run. I have learned to put maybe a spoonful. At school the other day, the cafeteria lady put a whole ladleful and I was nearly in tears. All of the teachers were laughing, some were worried, and my mouth has I'm sure become numb to anything hot! In church this week, I heard a quote that I have thought a lot about this week. The quote was from Jim Elliott, one of the 4 missionaries killed by the Waodani Indians. Jim said, "He is no fool who gives what He cannot keep to gain what He cannot lose". I just wonder...Am I willing to surrender my life so completely to God that I would die for my faith? Am I too absorbed in my own desires to be able to minister effectively? I pray that Eternal life with Christ would be more important to me than anyone or anything that I could ever have in this life. I also pray that my life would be such an amazing witness for Christ that lives would be forever changed. This week has been very busy! 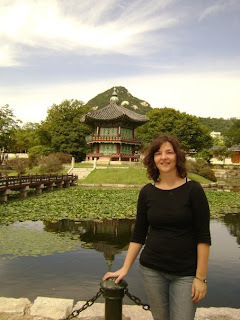 I had orientation every day and began learning a little about Korean language and culture. I can actually say a few things now and I don't feel as uncomfortable as I did in the beginning trying to use Korean words. Yesterday was my favorite part of orientation because I got to go visit the school that I will be teaching at Monday! The school is called Cheonan Namsam Elementary and it has around 1200 students in 1st through 6th grade. The kids were very excited about the new "foreign" English teacher coming to the school, but also a little apprehensive because I am a native English speaker. I visited all of the different floors of the school and it almost felt like I was a celebrity. The kids would surround me and say "hi"! They gave me hugs, some shook my hand, and others brought me a piece of paper and asked for my signature. I probably signed 50 papers while I was there. Some were too shy to talk to me, but seeing their smiles calmed my nervousness. I teach at Namsan Monday-Wednesday and then I teach at another elementary school called Sin-an on Thursdays and Fridays. I don't know very much about my second school, but I learned today how to take the bus and walk to the second school on Thursday. Tomorrow all of us will meet with some Korean pastors or Sunday school superintendants from Korean churches for lunch and work out carpooling to church on Sunday morning. The tradition in Korea is for all churches to begin at 11 a.m. and eat lunch together after the service. I possibly will have the opportunity to share a Bible story for the children on Sunday morning, as well. On Monday morning, there will be an assembly for all the students and teachers at my school and I will have to introduce myself to everyone. I am a little nervous, but I am confident that God's grace will give me strength. I have thought a lot over the past few days about why I am here. I know I came here to be an English teacher, but I also came here because God called me to serve in Korea. His purposes are much greater and far more vast than I could ever grasp or imagine. As a follower of Jesus Christ, my mission is always to have the mind of Christ, be willing to testify about what He has done in my life, and to share His love with everyone I come in contact with on a daily basis. My job here may be a teacher, but I am first and foremost Christ's disciple living in a world in need of the hope found in the Gospel of Jesus Christ! So I have been in Cheonan for 5 days now and I am finally beginning to adjust to the 13 hour time difference. I am surprised that I have been so adaptable to the time difference, the difference in food, and the inability to carry on a conversation with anyone except the "foreigners" in the city. One of the main things that I think has made it easier is the complete peace that I have felt since I stepped out of the plane onto Korean soil. I have not once been apprehensive about it or frightened, like I was when I began to make the decision to change my entire life and move here. I will definitely say that everything has been completely ordained by the hand of God. His presence has been very real to me and I am very excited about allowing Him to lead and guide me on this new journey in life. Sunday was an interesting experience for me because I went to my first Korean church service at Sung Moon("Holy Gate") Church of the Nazarene in downtown Cheonan. The entire service was in Korean, so for the most part I was totally lost and had no idea what was going on. During the music, I recognized "There's Power in the Blood" and "As the deer" which I sang along with in English. The District Superintendent who was also the Pastor preached from Jeremiah 33:1-3. Other than that, I have no idea what was being said during the service. Despite the language barrier, the Spirit of God moved me in an incredible way. I did not need to know the words that were spoken during the message, announcements, or the prayer. I only needed to use that time to be in communion with God and worship Him with my whole heart. It was actually one of the most meaningful worship experiences I have had because I realized it was not about the words, the songs, or about me at all, but it was about God and giving total honor, glory, and devotion to Him. Today began my orientation as an English teacher in the public school system in Cheonan. We all started our day with a health check-up at the local hospital. It involved checking our weight, height, blood pressure, an eye exam, an x-ray for something, as well as a blood test. We didn't really know what to expect and of course didn't really understand what any of the nurses or technicians were saying, but it went very smoothly after some confusion. We were then taken back to KNU for lunch as well as a brief introduction into the mission and emphasis of the university. It was amazing to hear of the technological advances that KNU has made specializing in service to people with disabilities and handicaps. There is definitely a great ministry here that reflects the compassion that Christ had for those who are blind, deaf, mute or unable to walk. I am excited about what God is going to do in my life this year as I adjust to life in Korea, learn a new language, and begin teaching elementary students! My prayer is that my life will reflect the love of Christ and be an example of a life changed and being changed by God!